The government can hack into any computer or smartphone on the planet. What sounded like a crazy conspiracy theory was exposed as truth with the 2013 NSA leaks from Edward Snowden. Since then, the deluge of CIA and NSA hacking programs filling the sky like rain hasn’t stopped. This is an exposé of the software programs and techniques used by the agencies to spy on the planet. Big Brother is watching. It’s time to watch back. Dozens of previously classified government surveillance programs are divulged in this alarming book! Contents include these fascinating topics: Edward Snowden; NSA; Mass Surveillance; Five Eyes; FinCEN (Financial Crimes Enforcement Network); Stuxnet; PRISM; MYSTIC; DCSNet (Digital Collection System Network); XKeyscore; DISHFIRE; STONEGHOST; Magic Lantern; ECHELON; Fairview; WikiLeaks; Vault 7; Julian Assange; Room 641A; The Doughnut; Fort Meade; Menwith Hill; Utah Data Center; ICREACH; Ransomware, Tor; “wannacry”; ShadowBrokers; and tons more. Axel Balthazar is at it again! 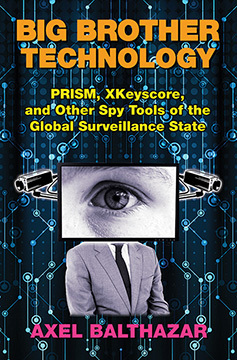 BIG BROTHER TECHNOLOGY: PRISM, XKeyscore, and other Spy Tools of the Global Surveillance State By Axel Balthazar. 264 pages. 6x9 Paperback. Illustrated. References.